Reprinted from Quadrant – April 2009. The story is basically that you can count on socialists to revert to type on the very first occasion they find. More famously stated as “never let a crisis go to waste,” which means, never miss an opportunity to socialise the economy a bit more whenever the opportunity arises. This is about Kevin Rudd’s self-revelation following the GFC after being elected as a fiscal conservative. What follows below is a full reprint from the magazine. It is quite astonishing to come across the economic and political philosophy of a prime minister and find that a self-described economic conservative turns out to be anything but. After years of seeing the phenomenal success of market-based economies in comparison with all other varieties of economic organisation, and having watched the fall of the Berlin Wall not all that long ago, there is a frightening recognition that amongst some people, nothing much at all has been learned. The same ideas that have populated and driven the Left for the past two hundred years just seem to come out of the woodwork at the first sign of an economy in trouble. Let this be understood about free market economies, and every other kind of economy for that matter in the modern world. All are subject to the business cycle. Economies have periods in which everything goes well and there are periods when they seem to fall apart. The business cycle was the name once used by economists for what is now called macroeconomics. But that earlier term had the added benefit of actually stating out front what can and must be expected in any and every market-based economy. Economic activity is cyclical. There will be periods of recession when economic growth slows and may even become negative, and during such periods unemployment will rise. It is another one of the many problems brought into the world by Keynesian economics that a proper understanding of the nature of the business cycle has almost disappeared. According to Keynes and those who have followed along since, because we had supposedly finally learned the secrets of aggregate demand, the business cycle, in particular its recessionary phase, had become a thing of the past. We could now control the level of activity by maintaining the level of aggregate demand through raising public spending when recessions threatened. As a result, even amongst economists there is no longer the degree of recognition there had once been that recessions are an inevitable feature of economic life. There is, moreover, only a single known way to avoid recessions. One can run an economy with little growth and next to no change, an economy in which everything stays pretty well as it always was. It is possible that North Korea and Burma have economies that are recession-proof, but they are hardly a role model for us or anyone. If we are going to have the tremendous benefits that come from constant change, innovation and invention, we are simply going to have to accept that every once in a while the economy will turn down, just as it did in 1975, 1982 and 1992, merely to pick dates more or less within the thirty years the Prime Minister has cited as the horror years of neo-liberal capitalism. And what is notable about those dates is that one has to be one of those rare students of the business cycle even to remember those years as having been especially bad. For most people, those particular downturns have for all practical purposes disappeared from conscious memory, although I expect the current downturn will be of a different historical character. But what the present recession will share with all of its predecessors is that one day, and not all that long from now unless we really do mismanage the downturn, even this current recession will also be a creature of the past while everyone busily gets on with rebuilding their wealth. But in every such downturn we find ourselves confronted with visions of salvation that have a common character and which seem to reappear almost the moment an economy finds itself on rocky ground. And with a certain kind of inevitability, these visions are based on the belief that it is the government that can save us from such periods of instability by spending our money for us before we can spend it ourselves, by running through our national savings and putting us into collective debt, by taking on a greater role in the allocation of finance through greater control of the banking and financial system, and by regulating the private sector so that there is almost nothing of any significance a firm can do without some government bureaucrat having the right to second-guess its every decision. These beliefs appear to be shared by the American President as well, which makes it seem that there is something in the air that has affected the times we live in. It is one thing for such beliefs to be held by small groups disgruntled with life, but it is quite another when these same beliefs are held by those at the pinnacle of our political structures. Since there is always a suspicion amongst some proportion of the population that running a business is in some vague sense disreputable, that business profits always come at the expense of the poor and the disadvantaged, and that there are so many external forms of harm caused even by the normal operation of commercial activities, there is always a constituency of varying size for such beliefs. Yet these are beliefs that will themselves cause great harm the more they become entrenched as the basis for political action. The discovery of the market and its power to provide for our material wellbeing is really only some 250 years old. It is, as these things go, a new idea, similar in its age to democracy itself, the political counterpart to the market economy. And given the transformation that capitalism has brought to our material wellbeing, it is plainly astonishing that there are still large numbers who want to overhaul and dismantle what has clearly worked so sensationally well, and put in its place some form of centrally directed economic system in which those who hold political power hold immense amounts of economic power as well. Kevin Rudd has obviously gone into the future to look back at today from these historical commanding heights so that he can already foretell how years from now we will retrospectively be interpreting our current economic events. History has changed and we can confidently look forward to the days when we will be able to look back and finally recognise the new world that was being created while we ate, slept and went about our business. The election of Kevin Rudd was, however, not some world historical event. On the other hand, the election of Barack Obama may have been just that. We may well have entered a different stage of history with a different ruling orthodoxy of which Obama’s elevation to the presidency is the consequence, and in the fullness of time he may yet become the active agent of change. Whether this is a good thing, I have very serious doubts. Not all change is for the better, and some changes make things decidedly worse. The question of the moment is whether Obama’s presidency, like Jimmy Carter’s, will end up reminding the American electorate why it is that their prosperity is bundled up in the existence of free markets, or whether instead, some other less market-oriented form of economic arrangements will take the place of our present structures as the preferred means of managing our economic affairs. Market-based economies are, after all, the only economic system that not only can provide us with the extraordinarily high standard of living we enjoy but is also the only economic system consistent with personal freedom. It is true that many people do get tired of having to look after themselves all the time. It is a great burden. But if they believe anyone else can and will look after them, they are in for a great and dismal surprise. The economic world we inhabit in the West developed out of the political changes that took place during the seventeenth and eighteenth centuries, although the roots are much older and should be traced back through ancient Greece. But it was not until perhaps three to four hundred years ago that personal freedom and individual liberty became important values within certain populations mostly found amongst nations bordering on the North Atlantic. The essence of these revolutionary ideas was that all of us individually should be recognised as having rights to pursue our own chosen course in life. These were radical ideas in places where the standard political philosophy was based on the divine right of kings. They are still radical ideas in a very large part of the world even now. It is not from the benevolence of the butcher, the brewer, or the baker that we expect our dinner, but from their regard to their own interest. We address ourselves, not to their humanity, but to their self-love, and never talk to them of our own necessities, but of their advantages. Is this cynicism or plain good sense? Should economies be forms of charity, or should they be self-sustaining organic structures in which all persons provide for themselves by producing what others want, then exchanging what one has produced for money, and then using the money received to buy the goods and services others have put up for sale? Nothing said by Smith nor by any other economist would even remotely suggest that such an economic system, a system dependent on free individuals and personal responsibility, should be an unregulated lawless jungle. But what he and others did say was that making individuals responsible for their own economic rewards would set in motion an economic process that would cause the momentum of economic growth to accelerate and the average level of prosperity to rise. Has any other social philosopher ever said anything more accurate or important than this? Has there been any other single instance in the whole of the social sciences in which a proposal has been shown to have been as true as this one? Leaving things to the market means leaving things in the hands of civil society. It means leaving decisions on what to produce and how to produce and where to produce and when to produce and who to hire and who to fire and how much to pay and all of the rest of it—it means leaving such decisions to any and all individuals who decide to try their hand at production for others. Anyone who produces must, of course, do so within the laws of the land, and not just within the letter of the law but also within its spirit. But what is important is that no one in government chooses who will run our businesses, nor do they decide which businesses will receive finance and which ones will not. All of this takes place within the community itself. In healthy economic environments, such decisions remain almost entirely out of the reach of government influence. This is partly economic, but is also partly political. On the economic side, in a productive economic environment, no one needs to get anyone’s official permission to start a business. There may be paperwork to be dealt with, and on other occasions the processes may be more difficult. But the terms of compliance are found in legislation. In properly managed market economies, fulfilling whichever are the legislative conditions takes hardly any time and is all that needs to be done. In this way, Bill Gates started Microsoft, an enterprise that was, not all that long ago, a very small microbusiness. This was not the “People’s Computer Company”. In starting the business, no one had to be related to anyone with political connections. No bribes were paid. It was just a matter of filling in some paperwork and the show was on the road. How many other firms just like Microsoft were started at the same time that have now disappeared? How many have been started since? The point is that all such firms were nothing other than the result of a private decision by private individuals to start a business to see where it might go. This is how, in part, innovation and technological change take place. It happens because we live in a society that encourages individuals to try their hand at business and to take on the risks and responsibilities of running their own firms. It is a society that teems with commercialised ideas. We are all the beneficiaries of such activities. But as important as are the economic benefits, the political benefits are perhaps even more important. In a community of free individuals who produce and trade amongst themselves, the government cannot threaten anyone with economic deprivation if they do not toe the government’s line. The freedom of individuals is in large part dependent on their freedom to earn a living and go about their lives without having to worry whether they have offended the government of the day. We no longer worry as much as we should about concentrations of political power. And with each passing year we seem to worry less and less about putting ever greater economic power into the hands of governments. A diffusion of political power was once understood as an essential if personal liberties were to be preserved. The nature of the problem does not seem as well understood as it once was and therefore the need for such diffusion is not understood as well as it once was. So to the Prime Minister’s article. Here we find a polemic on the evils of the capitalist system as it exists today. It is an imaginary system, bearing little reality to the world in which we actually live. The article is 7700 words long. No précis can give any more than a taste of how extreme the language is and how misconceived the thoughts. He has invented a villain, the neo-liberal, whose demise is now the mission the Prime Minister intends to hasten. The Prime Minister apparently believes that those on the other side of the political fence, the neo-liberals of his imagination, “fundamentally despise” the state and its role. He apparently believes that in the view of such neo-liberals, “government activity should be … ultimately replaced, by market forces”. He takes it as read that these neo-liberals have “sought, wherever possible, to dismantle all aspects of the social-democratic state”. The stakes are high: there are the social costs of long-term unemployment; poverty once again expanding its grim reach across the developing world; and the impact on long-term power structures within the existing international political and strategic order. Success is not optional. Too much now rides on our ability to prevail. We are here not discussing whether some policy or another might make the economic system work more effectively. This is not about whether there ought to be a stimulus package and if so, how it ought to be structured. This is beyond the technical side of economics and into the realm of good and evil. It is a psycho-drama in which Frodo and his mates take on Gollum in a bid to save the world. Not that there aren’t a few actual discussions of some of the causes of our present problems. The most lengthy deals with the Glass-Steagall Act passed into law by the American Congress in 1933 at the lowest point of the Great Depression but repealed in 1999 at the pinnacle of the dotcom boom. Its objective was to keep the banking function of financial institutions separate from their investment function. If you are a bank, you should not be investing in sharemarket equities. If you are an investment house, you should not be taking bank deposits. There is now a strong case for putting those prohibitions back, but there are arguments to be made on both sides. But to mention the problems of the banking system without also discussing the most egregious of the banking problems to have beset the American economy leaves out the single most important part of the story. The major distortions in the American financial system, and the single most significant distortion in bank regulation in causing the boom to finally descend into bust, were the directions given by Congress to the American finance industry, and particularly to its federally legislated arms, Fannie Mae and Freddie Mac, to provide housing loans to those who would not normally qualify. This is government failure of the highest order. A banking institution needs to be prudent in its lending practices. For a government to insist that banks and other lenders ignore what their balance sheets tell them is to create the conditions for just the kind of downturn we find ourselves in the midst of. A bubble is in essence activity financed by rising asset prices. The moment prices of such assets stop rising, an actual collapse in prices looms into view. The more that prices have been bid up by considerations of speculative future gains, the greater the subsequent fall. It was the flooding of money into the housing industry under government directive that caused this problem and has directly led to the painful readjustments which must now take place. The Prime Minister also points to what he sees as the inadequate institutional structures designed to assess risk. The Basel II Guidelines, he wrote, “have now been demonstrated to be inadequate because they left the determination of risk to flawed credit-ratings processes and the banks’ own ‘self-regulated’ internal assessment models”. What point is being made? Is it not perfectly clear that all credit-rating processes are flawed? No one can design a perfect credit-rating system, proof against all forms of market instability, since no one can ever know everything that needs to be known. By all means, come up with a better design if you can. But to believe that governments can guarantee the safety of an investor’s money, and in the place of such necessarily imperfect market-based institutional structures introduce some government scheme that will prevent mistaken decisions from being made, never mind put an end to out-and-out criminal activity and fraud, is, to put it mildly, an impossibility. We can argue the toss over the forms of bank regulation, the role of sub-prime mortgages, the inadequacies of risk-assessment institutions and any of the other issues raised by the Prime Minister. They will undoubtedly be debated for decades to come. The lessons to be learned from the present downturn are only at the start of an extended series of analyses that will stretch well into the next upturn and beyond. But there are two issues that need serious consideration, with more urgency given the policy options that have been chosen to deal with the present downturn. The first is the American budget deficits which have been in place since the start of the decade. There has been no end of concern by “neo-liberal” economists at the loose spending and flood of liquidity that has occurred in the United States which began as an economic counterweight to the ending of the dotcom boom and then accelerated as a means to maintain economic momentum after 9/11. However well meant those expenditure policies were, they were mistaken. But what allowed those deficits to occur without major dislocations in the United States was the economic role played by China. The American deficits were in large part used to finance Chinese imports. Under any normal scenario, the yuan would have rapidly risen relative to the US dollar and the imbalances would have been at least partially righted. Instead, the dollars that flowed into China were invested in American securities with the exchange rate largely unaffected. The Chinese had their own economic motives, which possibly included a wish to protect themselves against some future downturn just like the one we are presently in. But what can be said about the United States? If ever there was a bubble set to burst with devastating consequences, that was the one. The real lesson not apparently learned are the dangers of the budget deficit. The US dollar, being the world’s most important reserve currency, has an acceptance available to no other nation’s money. Whether with the present size of the projected deficit the US dollar will any longer be the currency of choice remains to be seen. But in the meantime, the deficits initiated a problem that we are going to try to solve by making the problem of the deficit infinitely worse than it already is. The Keynesian stimulus packages we see everywhere are an invitation to an even more unstable economic future. There is very little in what we see that ought to make anyone believe that the answer to past government failures is to increase the range and depth of such potential government failures in the future. But the second issue is by far the more important. That is the problem of complacency. The world’s economy has had it so good for so long that the kinds of internal mechanisms that normally pervade all economic and financial dealings seem to have weakened and in many important instances to have all but disappeared. Beyond that, many of the forms of retribution that the market is supposed to mete out for failure have been muted and on some occasions entirely suppressed. The most important deficiency that has slipped into the financial system over recent times has occurred because of its phenomenal success. That success has beguiled far too many into the belief that even without doing their homework everything will work out and where it does not, the government will put things right. This is a fatal mistake. And the more it is believed the more frequent will be the kinds of downturn we are now in. The government has a crucially important legislative and regulatory role to play, but the bottom line is this. The only form of regulation that works, and has ever worked, has been dependent on the self-interested controls imposed by people who are acutely aware that their own personal wealth is perpetually at risk. Much of what a government can be expected to do occurs after the fact, when regulators look at what has already happened and at breaches in the law that have already taken place. Laws make certain practices illegal, they do not put an end to illegal practices. The legal system must take the side of our financial institutions in ensuring that the rules of the market system are strictly enforced. In doing so, the legal system must be explicitly on the side of a smoothly functioning market capitalist system and there should be no bones about it. Allowing markets to work should be the cornerstone of the government’s role in creating prosperity. The evolution of the capitalist system has occurred side by side with the evolution of legal and institutional structures. The role of commercial law is to give all members of the community the opportunity to produce goods and services for each other without fear of plunder either by brigands or by the state. For the capitalist system to work, protections are needed from both. From the Prime Minister’s perspective, it seems the most important figure in the organisation of production ought to be the central planner. Based in some remote location, Canberra let us say, it is such planners who should be asked to direct our economic traffic in ways that best suit the whole community, which in reality can only ever mean directing traffic in ways that suit themselves. For us descendants of Adam Smith, however, the single most important character in the drama of prosperity and economic growth is the entrepreneur. It is entrepreneurs, taken collectively but acting individually, who do all of the work such planners would do in assessing community needs, securing finance, locating the business, putting capital in place, hiring labour, buying inputs and paying the bills. And not only do they rid us of the need for central planners, they do so with infinitely greater effect than could ever be achieved by some government employee, which is all that such planners can ever actually be. The magnitude of the crisis and its impact across the world means that minor tweakings of long-established orthodoxies will not do. Two unassailable truths have already been established: that financial markets are not always self-correcting or self-regulating, and that government (nationally and internationally) can never abdicate responsibility for maintaining economic stability. These two truths in themselves destroy new-liberalism’s claims to any continuing ideological legitimacy, because they remove the foundations on which the entire neo-liberal system is constructed. Both of these “truths”, to the extent they actually say something that has not been known for at least two hundred years, imply that we will see the introduction of a regulatory environment much different and more intrusive than the one that has existed in the past. Well then, how about something closer to home. A year before the economy went into its downward turn, we had the Reserve Bank along with the Prime Minister and Treasurer going on and on about how the inflation genie had been let out of the bottle and how it was an unfortunate necessity to be raising rates to cool the economy down. Yet even then—and we are talking about a policy that continued from November 2007 through to the middle of 2008—it was becoming very clear that the economy was slowing, not overheating. How much more mistaken in hindsight could this policy have been, to try to slow an economy that was about to plunge into recession? Are these the people we want to be adding to their portfolio of tasks? Do we really want to increase the government’s role in micromanaging our economy when it can so badly misread every international warning light that was then flashing in neon red? Who is the Prime Minister to tell us we need even more of his handling of the economy with all of its intricacies when he cannot even work out whether the economy is heading up or heading down, the most basic of all questions anyone with a mandate to keep an eye on economic conditions needs to get right? Now we are into a new and different panic mode, this time to provide a “Keynesian” stimulus to minister to our suddenly worsening economic prospects, a downturn having in large part been brought on by the monetary policies of the year before. And with this $42 billion package we are heading deep into deficit. We are racking up massive levels of debt in a previously debt-free economy. And for what? To insulate our houses and build new libraries for our schools. The stunning lack of imagination is possibly the most astonishing part about the stimulus. Even if I thought it would do some overall economic good, which I don’t, are these really the priority issues for the country? Is there really nothing better we can throw $42 billion at? For all the Prime Minister’s criticisms of neo-liberal economists, is this really the best we can do? The idea that building better schools will add to Australian productivity in anything other than the longest of runs is one of those nonsensical ideas that have been bequeathed to us by Keynesian economics. According to Keynesian theory, it is the spending itself that supposedly causes growth, not the value created by the outputs of the economic activity. We will chew up many billions of dollars of existing value to improve our schools, but when will we get the payoff? Even if we ultimately make every one of our sixteen-year-olds 20 per cent more productive because of all this expenditure, when is the soonest we can get the productive dividend? In twenty years, perhaps, but no sooner than ten. In the meantime it is money spent that adds nothing to our productive capacity while adding huge amounts to our national level of debt. Not till those sixteen-year-olds are out there in the workforce and pulling their economic weight will we have the additional wherewithal to pay off the debts we are accumulating now. Until then, we pay the billions of dollars of interest. And that, of course, assumes we actually do end up making our workforce more productive because of these outlays today. It is pointless to go on. If you are of the opinion that we can make ourselves richer by having each of us write ourselves a cheque, then there is nothing more to be said. Perhaps we have become so wealthy that we can take a huge proportion of our annual output and sink it into the sea without serious misadventure. But however you look at it, that is what is happening. We are taking our productive capabilities and directing them into dead ends and dark corners. It is a terrible waste. If you really were worried about the poor and the disadvantaged, the low-paid and the unemployed, this is not how you should go about giving them jobs, adding to their wealth and improving their lives. Governments tend to like Keynesian economics because it gives them the answers they want to hear. So until that eventual day of reckoning, and that day of reckoning will eventually come, it is unfortunately the only kind of advice to which governments are likely to listen. 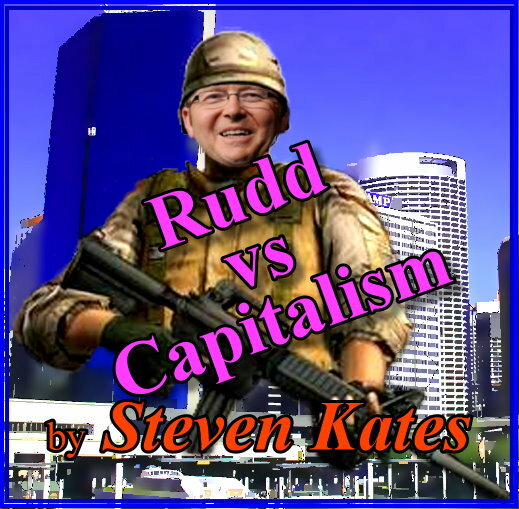 Dr Steven Kates teaches economics at the RMIT University in Melbourne. He will be completing his term as a Commissioner on the Productivity Commission this month. He is currently writing a book, Defending the History of Economic Thought, which will be published in 2010. Obama’s stimulus package is breathtaking in its potential to cause damage. We will know soon enough whether massive deficits and immense levels of government waste are the answer to an economy in recession. Smith’s very next line reads, “nobody but a beggar chuses [sic] to depend chiefly upon the benevolence of his fellow-citizens”. In the welfare state there are many who now do precisely that, depend for their livelihoods on the benevolence of their fellow-citizens. Just for completeness I note that it is possible to buy before producing and earning an income. That is what credit markets allow people to do. But it will only happen if those who offer credit have a realistic belief that the goods and services that will be bought when the loans are repaid with interest will actually be produced in time to meet the new expenditure. Basically, however, goods buy goods through the intermediation of money. I should add one more, which is somewhat esoteric but is now an area of quite some debate. These are the “weak and defective” mark-to-market accounting rules that have been imposed on business by government decision (p 24). There are some who believe the deflation in the American economy will continue well into the future unless these rules are reversed which only the government can do. This entry was posted in Australian economy, Economic theory and policy, Politics - Australian and tagged GFC, kevin rudd, stimulus by lawofmarkets. Bookmark the permalink.